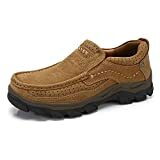 Most Comfortable Mens Walking Shoes For Travel - MR ELLIS ! Most foot ailments are related to wearing the wrong types of shoes. Even if you are wearing shoes that fit you perfectly, they might still not be as supportive as they should be. Your feet need help and support to function properly. Things like cushioning, arch support and heel stability are essential in the health and comfort of your feet. So when you go shopping for shoes, don’t just look at the size. This is especially important for walking shoes. The repeated motion while walking brings out the worst in shoes. Even a tiny problem can become a major issue after a couple of hours of walking. So be extra careful when shopping for shoes to wear on your next vacation, hike or business trip. This guide will help you choose the most comfortable men’s walking shoes for travel. Before you even try on a size, make sure you are buying the right shoe design. A good walking shoe should be flat (or with a very low heel), lightweight, flexible, comfortable and breathable. It should also have a durable sole with good traction. 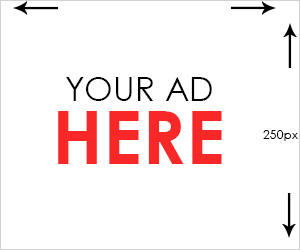 The exact type of shoe you need will depend on your needs. If you are going hiking, look for proper outdoors shoes. For vacations, shopping and other casual situation loafers, sneakers and sports shoes are ideal. For long walks along the beach or around town, you may find sandals to be more comfortable. 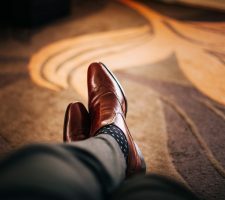 If you are going for a business trip or commute to work on foot, there’s a wide variety of formal walking shoes that are very comfortable. Once you have decided which shoe design you want, select the right size. You should already know your foot size. But if it has been a few years since you last measured your feet, it’s a good idea to take new measurements. Your body is not static. Generally, a comfortable walking pair of shoes should be a size or half a size longer than your feet. This ensures you have enough room especially at the front. You should be able to wiggle your toes without any restriction. When you are shopping online, check the manufacturer’s size guide. This is because different shoes can fit differently even if they are the same size. Your arch – the raised middle part of your foot – needs support when you are walking. If you feel pain or sore in that area, it means your shoe doesn’t have good support. Make sure the insole’s design reduces stress on your arch. You’ll need even more support if you have flat arches. I actually recommend looking for walking shoes specifically designed for people with flat arches. They have extra support and motion-control features to make walking more comfortable. Finally, make sure that the shoes have good cushioning. Walking for long without properly cushioned shoes is not only uncomfortable, it can also cause serious damage to your feet. The insole or insert should be thick enough that you can walk for long without any discomfort at all. Memory foam or gel inserts are usually the best. This pair of sandals is perfect when the weather is too warm to be in closed shoes. The toe area is enclosed so you don’t have to worry about your feet getting dusty. The sandals feel very light on your feet and are flexible too. This makes for comfortable walking even over long distances. If you are going travelling to a warm area where you plan to do lots of walking, I highly recommend them. The main upper material is leather. It will last for years while still looking like new. The stitching is high quality so you can be sure it won’t tear after just a few months of use. The inner textile material cradles your foot in a soft and smooth lining. It’s gentle on your skin and the insole does a great job absorbing impact as you walk. The sole is gum rubber. It’s light but tough and durable. These are premium leather shoes designed to last for years and provide maximum comfort. They are made from full grain leather with professional-quality stitching and a durable gum rubber sole. The inner material is also leather. It feels smooth and cool. It doesn’t get too hot and stuffy even in warm weather. So if you are looking for a casual pair of walking shoes for the summer, this is a good choice. The shoes contain foam cushioning inside which cuddles your feet as you walk. You can walk for hours without feeling any strain. The gum rubber sole has a special sipped design to increase traction especially when you are in water. 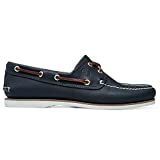 Since boat shoes were originally meant for nautical use out in the sea, they are designed to maintain maximum traction on wet slippery surfaces. But the style is versatile enough that you can wear the shoes just about anywhere you want whether it’s to the beach, a shopping excursion or a business seminar. They come in two colours: dark brown and nautical blue. I love loafers for their versatility. You can dress them up or down depending on the situation. This pair by Josef Seibel is perfect for semi-formal and casual use. A combination of lightweight design, a cushioned interior and flexible sole makes the shoes great for walking and travelling. The outer material is leather so you can be sure it will last long and still look great even after years of use. If you walk a lot and need shoes that can take a beating, get this pair. The inside is soft and smooth textile that prevents blisters and skin aggravation. The toe box is wide enough for your toes and comfortable even if you have bunions. The rear is designed to cup your heel in a stable and supportive grip. A low-heeled design ensures proper support for your arch while a cushioned insole keeps your feet well protected from walking impact. The shoes are available in two colours: beige and brown. If you are planning to do some serious walking outdoors, you need shoes that are up to the task. They not only need to be comfortable, they should also be able to withstand a tough outdoor environment including rocks and thorns. These casual moccasins fit the bill. The outer material is cowhide leather, tough and guaranteed to last for ages even with frequent use. The tough but lightweight rubber outsole can handle all kinds of terrains from sandy beaches to rocky hiking trails. A soft insole ensures your feet are always comfortable no matter how rough the terrain gets. You also don’t have to worry about your feet getting all stuffy and sweaty in warm weather. The leather upper is punched with ventilation holes that keep your feet dry and cool. The toe box is wide enough for your toes. You can comfortably walk in these shoes even if you have bunions or corns. The shoes are available in two outdoor-friendly colour styles: brown and bronze. 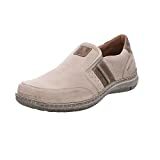 If you are looking for a nice and stylish pair of walking shoes to wear to your next vacation or festival, these slip-on boat shoes are perfect. The upper is made from a vintage canvas fabric. It’s tough but very flexible, which makes walking much easier. The canvas is tightly stitched to prevent any tearing. The inner material is textile. It feels soft and gentle on your feet. No need to worry about blisters after a whole day walking in these shoes. The insole is memory foam, which is really good at cushioning your feet against impact and vibrations. The memory foam is air-cooled to avoid any heat or sweat build up especially in warm weather. The sole is flat. It starts out thicker at the heel and tappers towards the wide toe box. This design creates a nice springing motion that reduces fatigue and helps you walk faster. It’s made from a material called EVA which is light and bouncy but durable. Great versatile design that is available in several colours including brown, blue and white. Super comfortable memory foam insole. Which Is The Best Colour of Shoes To Go With My Suits? 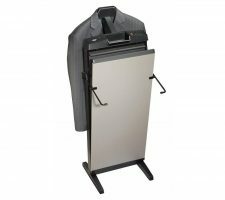 What Is The Best Trouser Press On The UK Market? 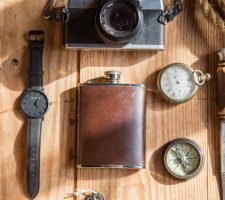 What Is The Best Hip Flask On The UK Market?